Area 332 A. 3 R. 8 P.
Martin Geraghty Martin Geraghty Private dwelling with 2 rooms. Julia Geraghty Julia Geraghty Private dwelling with 3 rooms. William Garvey William Garvey Private dwelling with 2 rooms. Mick Kyne Mick Kyne Private dwelling with 2 rooms. Martin Burke Martin Burke Private dwelling with 2 rooms. Mark Concannon Mark Concannon Private dwelling with 2 rooms. Mick Garvey Mick Garvey Private dwelling with 3 rooms. Michael McHugh Michael McHugh Private dwelling with 2 rooms. Pat Burke Pat Burke Private dwelling with 2 rooms. Bridget Garvey Bridget Garvey Private dwelling with 2 rooms. Michael Kyne Michael Kyne Private dwelling with 1 rooms. Mary Garvey Mary Garvey Private dwelling with 2 rooms. John Barrett John Barrett Private dwelling with 2 rooms. John Joyce John Joyce Private dwelling with 2 rooms. Thomas Noone Thomas Noone Private dwelling with 1 rooms. Kate Brown Kate Brown Private dwelling with 2 rooms. Click on the Griffiths Valuation Page # 160 to see a list of tenants with plot numbers to match the Griffith map. The map has each renters plot numbered and recorded in the Valuation book so the exact location of your ancestors plot can be ascertained. 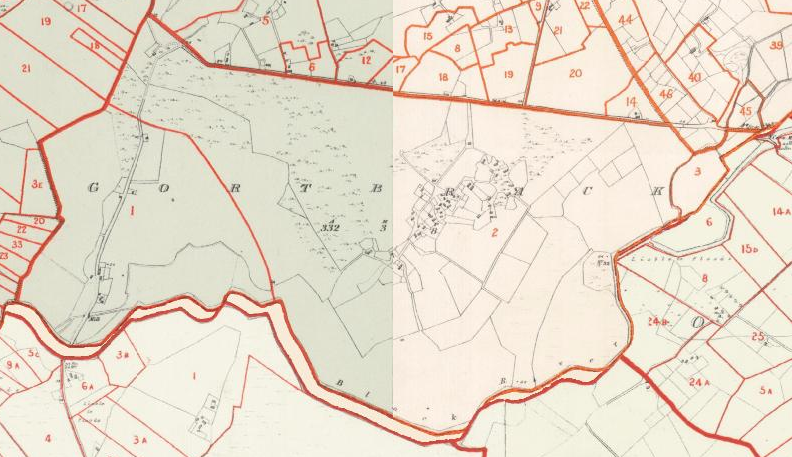 Click on the Griffiths Valuation Ballinrobe Page # 160 to see a list of tenants with plot numbers to match the Griffith map. Gort Breac , speckled field. Gortbrack : Inq. temp. Eliz. Gortbracke : Inq. temp. Jac.. I.
E. by Moyne td. ; and S. and W. by the ph. of Killursa, in the Co. Galway. It contains 332a. 3r. 8p., and is the property of Captain Lynch, of Ballycurrin House. It is let to tenants at will, in farms of from 4 to 12 acres, at a yearly rent of from 16s. to 22s. per Irish acre. The Greater part of this td. is rocks and rough boggy land. The tenants are all Catholics.